Most health-conscious people don’t usually resort to eating non-food, and instead concentrate on eating whole, organic foods that don’t come from inside a big food manufacturer’s fancy package. Going further, many consumers are standing up for their right to eat healthy, and are boycotting Kellogg’s. Want to know why? Read on. 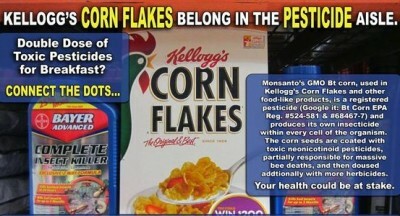 Kellogg’s corn flakes and other food-like products that the company makes are full of Bt Corn. The EPA has registered Bt corn as a pesticide since the crop makes its own insecticide. (Reg. #524-581 and 68467-7) Bt corn has been shown to cause serious health problems. The makers of Bt corn, primarily Monsanto and Syngenta, are responsible for selling this food-stuff to companies like Kellogg’s, but they have the choice to source their corn from organic farmers, and simply don’t. Syngenta’s website says that Bt corn can ‘make a farmer’s life easier,’ but this has also been proven to be grossly false. Farmers in the Philippines who sowed Bt seeds went bankrupt. “An estimated 270,000 small-hold farmers in the Philippines are being forced to grow GM corn and ending up in debt as a result. Indian farmers are committing suicide, too, specifically due to Bt seed. So, to summarize, Kellogg’s company is using GMO Bt corn and other GMO crops in their food that they then sell the world to the tune of at least $12 billion annually, and in the process they are poisoning people and bankrupting farmers. What’s more, Kellogg’s foods are full of GMO sugarbeets – another reason consumers are joining the boycott. Is it really worth that morning bowl of cereal? An argument for Gm crops is that they can be grown in harsh environments to feed struggling people in the third world, but morning star newspaper has suggested this is not the case. It is simply large corporations trying to make a huge profit at the expense of others and destroying other more sustainable organic farming. It would seem large corporations are poisoning people with pesticides as well as making them reliant on them. Third world people do not own enough land to grow adequate food supplies or cannot afford to buy seeds to grow, lack of irrigation of land is also a major problem. As well as lack of rainfall, no rain nothing will grow. This lack of rain fall has been linked to deforestation, little transpiration from forests leads to droughts in other parts of the world, use of fossil fuels coal and oil is bringing about global warming on a huge scale leading to flooding in some parts of the world no rain in others. We do not eat any cereal anymore, they are full of GMO ingredients. The only safe corn for now is blue corn as in blue corn chips. Making the change with the kids was hard but it was literally mandatory for us if we wanted to stay healthy. Good bye Kellogg. All the old standbyes are literally uneatable now days. We have made some of our own cereal mixes uses ancient grains and dried organic fruit and nuts. I highly recommend the site the thehealthyhomeeconomist.com for organic recipes and the how to section on making your own soda for instance. don’t eat cereal grains even organic are not very healthy; unless you soak grains that have phytase in them for 24 hours in an acid medium such as lemon juice or vinegar then rince and cook they are full of phytic acid which leach your valuable minerals right out of you. weston price foundation has tons of info on this….. its changed my life!!! This poison grain is even killing livestock. Why would humans allow this. Maybe Monsanto is not human. Corporations are not people. I’m a company owner and refuse to make my company a corporation. Know why companies incorporate? So they can’t be sued and lose everything, in other words they don’t have to be acountable for the companies actions. Think about that for a minute, and why would you ever want to hire an entity that doesn’t have to be held acountable for their actions? In this law suit crazed world, you have to stay focused to do good honest business…..
That is a pretty broad statement. That may well apply to these money crazed big companies. But to own a business, at any level and not protect yourself by incorporating is foolish. There are people out there just looking for someone who is not protected. Incorporating is no different than insurance on your house, car etc… Let’s hope some loser does not screw you out of all of your hard work someday because of an innocent mistake. You cannot put all business that incorporate into a big pool of people that have no accountability, your statement is irresponsible and presumptuous. Buy Organic NATURE’s PATH instead. Lots of yummy cereals and they were ORGANIC from the beginning! Reward the good guys! Too bad Big Gova had them recall their products for containing 100% all-natural organic salmonella… several times. I only eat organic…the GMO stuff is bad news! When I eat my favorite corn flake from Kellogg my stomach hurt. I guess I have to take more probiotic when eating this type of food. Your stomach hurts because it has been poisoned with herbicide and pesticide filth at the cellular level. Probiotics probably have no effect on the digestive system. If they did, it would be in the intestine and not the stomach. Nice claim though.